Hesston coach Clint Rider understood his Swathers were a surprise all throughout the Class 3A state playoffs. “If somebody picks us to win, I think I might have to call them up and tell them they need to change their pick,” Rider said before state. Hesston overcame a 1-3 start and defeated higher-ranked Phillipsburg and Hoisington in the postseason. In the championship, Hesston lost 48-42 to Rossville in overtime. Class 3A, the state’s biggest classification with 64 teams, had just one team from 2006-15 reach a final with more than one loss before Hesston, which finished 10-4. That lone squad was Conway Springs, which won the ’08 title with a 12-2 record. Hesston’s turnaround marked one of many underdog stories in 2016, the overall theme of this fall’s Kansas high school football season. The 2016 season yielded more turnarounds that led to state title game appearances/titles than any other year from 2006-15. Pratt finished 12-1 and won Class 4A-II. Osborne went 13-0 and captured the Eight-Man, Division I title. Both teams finished 4-5 in 2015. Plainville, a 3-6 squad each of the past two seasons, moved to 11-2 and lost to Troy in the Class 2-1A state title. From 2007-15, just three squads had losing records one season and then reached the final the following year. Those squads were Blue Valley (5-7 in 2009, 12-1 in 2011), and St. Thomas Aquinas (3-7 in 2013, 9-4 in 2014). Both are Class 5A/6A schools who play in the challenging Eastern Kansas League. Mill Valley, the back-to-back Class 5A champion, finished 9-4. The Jaguars lost four in a row in their first season in the EKL before winning their final six games. Three of the Jaguars’ four losses in league play came by at least 17 points, including a 64-21 defeat to Class 4A, Division I champion Bishop Miege. However, four of Mill Valley’s six consecutive wins to close out the season came by a combined 23 points. 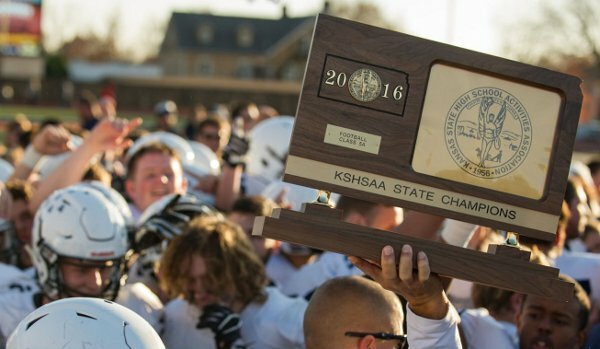 From 2006-16, Mill Valley is the only Kansas team to win a state title with more than three losses. Just two squads, 2013 Blue Valley (5A) and 2011 Centralia (2-1A) have won a title with three defeats in that span. Mill Valley was all over the 5A rankings throughout the year, including dropping out at one point. The Jags were behind Aquinas nearly all fall in the polls after a regular season loss to the Saints. Mill Valley then defeated Aquinas, 14-13, in the sub-state title. Furthermore, Goddard was 6-4 in Class 5A last year and lost to Mill Valley in the title game, 35-34 in double overtime, this fall. Dighton went from 5-4 in 2015 to a 12-1 season and Eight-Man, Division II championship appearance this fall. Dighton, which lost 68-22 to Hanover, reached state for the first time in school annals. “I am pleased with these guys,” Dighton coach Ken Simon said. The five teams that reached state a year after winning six or fewer games was also the most since 2007. The only other season that had more than two was 2014, which had four. Those five squads – Pratt, Plainville, Goddard, Osborne and Dighton – each had several areas in common. All five had quarterbacks who rarely threw interceptions. Four had at least two rushers with 924 or more yards. Four had 2015 turnover margins that were negative or zero. This season, the five squads averaged plus-20 in turnover margin. The rise of those teams helped yield a rare shift with some perennial contenders. Victoria, in Osborne’s district, ended its streak of 14 straight playoff berths, the longest current run in eight-man football. Conway Springs missed the playoffs for the first time since 2006. Bishop Carroll fell to Goddard in the Round of 16, its shortest advancement since 2004. Andale, which lost to Buhler in districts, also lost in the first round of the postseason for the first time since ’04. Even some of the traditional powers considered themselves underdogs, including, three-time Class 3A champion Rossville, and Buhler, the 4A-I runner-up to Miege. “Nobody probably counted on us, and I think the kids take a lot of pride in that as well,” Rossville coach Derick Hammes said. Rossville lost to rival Silver Lake in the regular season and was ranked behind Hoisington, Silver Lake and Phillipsburg most of the year. Buhler lost, 45-21, to Wichita Collegiate in Week 3, its worst regular season loss in more than nine years. Yet the Crusaders never lost again until state. “To be a rebuilding year, and to be as successful as we have been…appreciative of the kids and our coaches that have worked very hard together,” Buhler coach Steve Warner said. Rossville senior guard Malcolm Gillum is 6-foot-3, 305 pounds and the heaviest player on the Bulldawg roster by more than 80 pounds. Entering the season, Hammes labeled the offensive line “a huge question mark” because of the lack of returning experience. A first-year starter, Gillum helped block for another explosive Rossville offense. The Bulldawgs averaged 42.9 points per contest and led Class 3A in total points. Gillum’s improvement encapsulated a key underrated trend among elite teams this season – the growth of offensive line play. Hesston and Buhler were teams that had multiple inexperienced players among the offensive line. Osborne’s line went through multiple changes on both sides throughout the year and yielded strong improvement late. “We knew that we were going to be so youthful and so inexperienced up front,” Rider said. The groups gelled together, which paved the way for November runs.